Hurrah for made up celebrations! When was this day declared for the cheese lovers of the world? Thank you to whomever came up with it. Whole Foods was having a sale on their organic cheese, but even with the 20% off it would be pricey. So I went to Honest Weight instead (support local business). Nibbled on a cheese sample or two and looked around the random cheese pile. ... until tonight. I picked up five small wedges. Mostly soft cheese, majority of the bleu variety. Honestly, I picked it only because I saw Slyboro on the label. I've had their cider... I like their cider. So a cheese washed in it shouldn't be that bad... right? Wrong. Wrong wrong wrong. It smelled funky, and tasted even worse. M identified the odor as sewage; what I thought of it truly will not be posted here. What I will say on the matter is that I don't think they meant "grassy notes." That may have been a typo. Okay, I think the safe bet would be to stay away from raw goat milk cheeses. They. Are. Not. Good. The Cascadita is more of a hard cheese, but it just doesn't taste right. Not at all pungent as the Slyboro, but there is a definite off taste. Not sure how to describe it... it taste like freezer burn (if that makes sense). It's as if the cheese absorbed the flavor of whatever it was in. Plastic. Waxy even. Weird, since the cheese wasn't covered in wax. Four dollars down the drain. 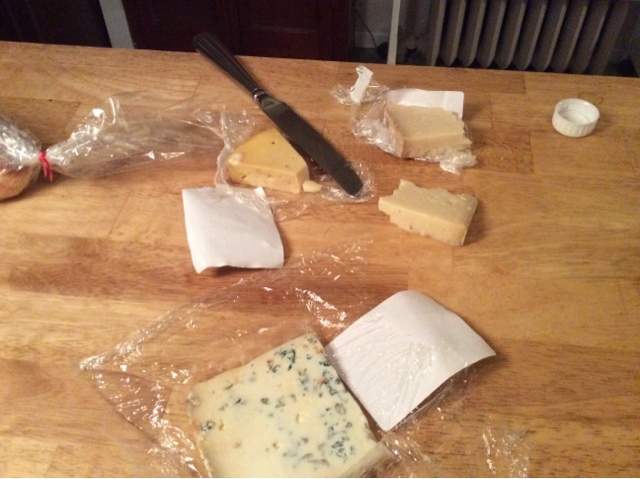 We opened a third cheese (Onetik Bleu Des Basques - Thermalized Sheep Milk (France)) and that was delicious.